Hilariously reminding us of all the shade tree planters that came before us! Everyone has a shade tree planter in their lives. 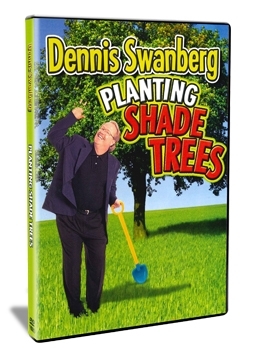 You may begin to realize as you listen to “The Swan” that you too can be a shade tree planter. Sit back and laugh as he takes you down memory lane…remembering those who have gone before us. We can all relate to his stories of family and friends who have impacted our lives by leaving a legacy of faith and hope for the future. Grab a shovel and hang one…this journey with “America’s Minister of Encouragement” is one worth taking. What Does It Take To Plant A Shade Tree? "I'm Drinkin' From the Saucer"
Shade Tree Planters: Billy Graham, Slim Pickens, Don Knotts and John Wayne.